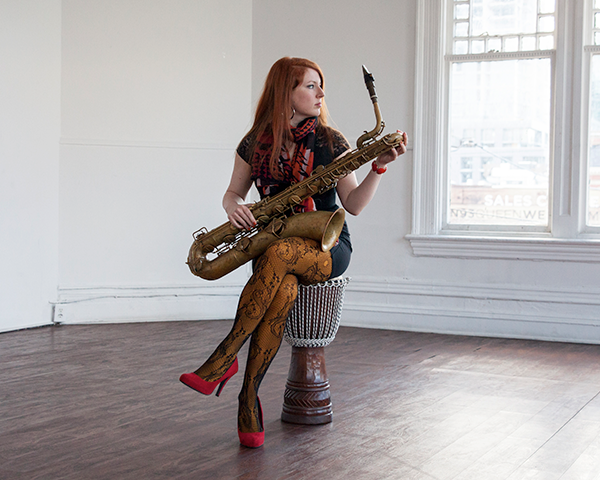 Alison Young is a Toronto-based saxophonist, vocalist and composer. Since moving to Toronto in the early 2000s to study music at the University of Toronto, she has been an active presence on the jazz scene both as a leader and side-person, appearing regularly in the city’s jazz venues, theaters and festivals. Young has toured across North America, Europe, South America, the Caribbean and Asia with acts such as Joe Sealy, Big Rude Jake, The Heillig Manoeuvre, Johnny Reid and the Shuffle Demons, and has appeared on nearly 30 recordings, including JUNO nominated albums by Alysha Brilla and Shakura S’Aida. Her compositions have been featured on JazzFM, CBC Radio One and CBC Radio-Canada. In 2017, Alison was chosen as one of the ‘Best 35 Canadian Jazz Artists under 35’ by the CBC. Later that year, she was featured in Pat LaCroix and Ted O’Reilly’s book, Toronto Jazz Treasures alongside many of her musical heroes. “Wearing gleaming red stilettos and a black orchid over her left ear, she played with endless creativity and flair.” Ted Panken, Downbeat Magazine, February 2015.